Latina Health in the U.S. In today’s world we are surrounded by technology that connects us to each other through entertainment. This includes films, news, and social media. We will be exploring the way that stereotypes have formed over time by these channels of entertainment. We interviewed how the Latinx student population in Michigan State University feels about certain stereotypes that are portrayed in all forms of media. As a group we chose this topic because with the 2017 presidential election, we as a population were targeted for some personal viewpoints that people have against us. This included misinterpretation by the media to the population nationwide. This affected us both locally in Michigan State University and nationally with many incidents that were hurtful towards the Latinx population. Since the 1900s when movies started becoming a popular source of entertainment, they became the window for people’s perspectives on the world. This limited them to the reality of others and stereotypes were born. 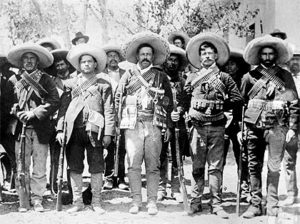 We see that for the Mexican population Pancho Villa was a representative of the revolution in Mexico against the corrupt government. He became a role model to some but to others a bandit. In the United States, Hollywood started making movies of him portraying him as a criminal. His attire included a big sombrero, mustache, and guns. This amounted a stereotypical depiction of Mexicans. Scholarship argues that, “portrayals were so insulting that for several years Mexico banned movies due to their negative depiction of Mexicans” (Padgett). This really hurt the image of the Mexican population. Now when people think of a Mexican the first thing that comes to their mind is a man with a big sombrero, a mustache, and with guns. Another example of how we are portrayed is by the character of the India Maria. The movies of the India Maria are some of our childhood favorites that we enjoyed and laughed about. 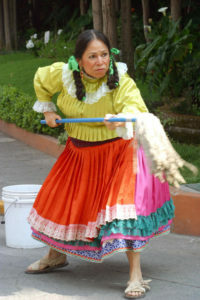 This character that portrays the innocence of a indigenous women from a rural area that goes into big cities and interacts with many foreign identities. She displays what outsiders think are typical roles for Indigenous people such as a housemaid, cook, farmer, and artisan of her indigenous culture. She is always in braids with ribbons, with Indigenous attire and a rebozo. This image that these films make of an indigenous women stick in people’s heads. In a lot of the movies she is always getting in trouble, and people assume that she is dumb.This creates a stereotype on what the people think of indigenous people. These examples are some of many that the film industry has portrayed the Latinx population as a whole. This has to do with the lack of representation of Latinxs in the film industry. The Annenberg School of Cultural Communicators Project conducted a study that showed that in the past, not only were Hispanics represented negatively but also they were shunned away from most of the media. The Annenberg School found that between 1969 to 1978, only 2.5% of prime-time television characters were Hispanic. The study also found that the when television does portray Hispanics, they are usually have darker features, darker skin, and thick accents. This excludes out Hispanics that do not have those features. This gives the world and anyone who watches shows and films a one sided view of all Latinxs. Interviewer: With what you see in the media, how are Latino men portrayed differently than Latino women? Currently, how people see us has not changed in the aspect that negative stereotypes are still the first thing that they think of instead of good things. Today with the internet it makes it easier for millions of people to see negative stereotypes and agree with them then three decades ago. Social Media has become a way for people to voice their opinions on how they feel towards a topic and not have to face anyone. This is shown with a lot of hateful comments towards people. We see this in the twitter post that Donald Trump has posted on social Media, which states “Druggies, drug dealers, rapists and killers coming across the southern border. When will the U.S. get smart and stop this travesty?” Comments like these have really upset the Latinx population because they know that not everyone that comes to the United States, come to be criminals. Interviewer: Druggies, drug dealers, rapists and killers are coming across the southern border. When will the U.S. get smart and stop this travesty? How do you feel about this? Interviewee: It comes off wrong to me and it makes me angry and sad because it’s not true. People assume that, that’s us (Latinx community) but that’s not. They are listening to what other people have to say but they don’t know where we come from or what we do to be where we are now. So it’s very hard to see or hear something like that. This is a stereotype that Trump is putting out into the world through social media that does so much harm to people because then they become victims of other more severe crimes. A study from the University of Kansas showed how Latinos are affected by stereotypes presented in the media while in college. Latinos who identified strongly with their Latino background were more likely affected by their stereotypes while in a predominantly all white University. Another stereotype adding from being gang members, Latin lovers, drug dealers was also being unintelligent which frequently causes others races and ethnicity to doubt Latino college students. For the news, they get to cover what will get them more ratings instead of what people need to know. This allows them to make up lies or over exaggerate on the type of crime being talked about. They misrepresent people of color and make them look bad and when they do that it gives people a bad view of Latinos and makes them look at us with negativity. Latinos accomplishments are rarely recognized because they focus more on the negativity of things. An example is the 45th’s president speech, where he talks about Mexicans having lots of problems and are rapists, drug dealers, and criminals. He’s a very well known person and when he says things like that people think that it’s okay and that they can say it as well. For example, one recent issues is the case of an off duty police officer and the thirteen-year-old boy. The news outlets called the boy a juvenile delinquent and made him look bad. Many news outlets did not poorly portray the officer who tried dragging the kid back into his yard or pulling a gun on teenagers. Films and tv shows like Coco, Jane the Virgin, Mcfarland USA, and Instructions Not Included are examples of movies that portray positive views on Latino life experiences. We need more of these movies to show the public of the reality that Latinos go through. This includes hiring more Latinos in these industries that can write, direct, and act our stories. We need our people to show the world who we are and that we are not what people think we are. These movies are made by Latino writers and they prove a point, which is, that Latinos can be be in control, stand up for themselves, and have a future. Interviewer: How is our population represented in movies? Interviewee: I think our population is really misrepresented in media and the things they are represented in are always the same kind of roles within movies or shows. It’s always like the stereotypical person who just came from another country or it’s someone taking care of the children and it’s never someone who’s strong or if it is and it’s minimal. They have a really strong accent where no one can understand them and if they are not represented in one of those criteria then they are the funny person or the person people make fun of. I think that’s really not right because we are a huge population in the U.S. and why would someone represent us in that way where people can see us as only that kind of people. For social media, we can not control what people choose to post and definitely can’t stop it. What we can do is repost the good things that our Latino community are doing, like going to college or achieving great things. Putting out positive things and if people see us doing it then they might do it as well. The more we show the good things, the better chance that someone who doesn’t know much about the Latino community, will see it and hopefully change their perspective on us. News outlets, throughout the years, have become more known because of how they are all over the internet. A solution to the problem of not having representation in the news media, would be as a public push for more representation of Latinx people in these news media. This mean that in everything from the person hosting, to the person of wardrobe. “Latino Portrayals In The Media.” Latino Portrayals In The Media. N.p., n.d. Web. 20 Feb. 2017. “Study shows media stereotypes shape how Latinos experience college.” The University of Kansas. N.p., 08 Sept. 2015. Web. 23 Apr. 2017.